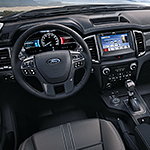 The Ford Ranger is a new addition to the line-up of vehicles at Ron Carter Ford. It's a great option for anyone looking for a mid-size pickup that's durable, rugged, comfortable, and reliable. It's ready to hit the road no matter what the forecast is calling for. Quickly shift between 2x4 and 4x4 drive modes with the electronic shift-on-the-fly system. You can choose from either 4x4 high or 4x4 low depending on the conditions, and everything can be adjusted with a simple turn of a dial. Those in the mood for off-roading can go with the FX4 Off-Road Package. It comes with the Terrain Management System, in which you can manually select drive modes that are optimized for grass, mud/ruts, or sand, for example. It also comes with Trail Control, a driver-activated system that comes in handy when exploring rough terrain. The high-strength steel frame of the truck also provides good clearance.